MEOP (Marine Mammals Exploring the Oceans Pole to Pole) is a consortium of international researchers dedicated to sharing animal-derived data and knowledge about the polar oceans. 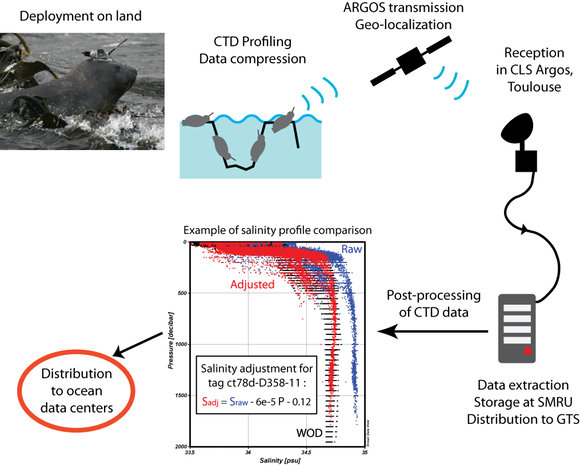 Collectively, MEOP demonstrates the power and cost-effectiveness of using marine mammals as data-collection platforms that can dramatically improve the ocean-observing system for biological and physical oceanographers (Treasure et al. 2017). MEOP started as an International IPY (International Polar Year) project in 2008, and it is now a large consortium that acts as a bridge between the scientific teams deploying the tags and the front-end users. The MEOP data is useful to assess how animals respond in their foraging behavior to changes in oceanographic conditions. It is also of great value to study the ocean itself. Through the years, instrumented animals have become an essential source of temperature and salinity profiles, especially for the polar oceans. Historically, the SMRU (Sea Mammal Research Unit, Scotland) was the first to design and build a miniaturized tag incorporating a CTD sensor that could be carried by animals. The initial development was partly funded by the Norwegian Polar Institute, with Kit Kovacs, Christian Lydersen and Ole Anders Nøst being the main investigators of the project. A more appropriate tag, the CTD-SRDL, was consecutively developped in 2003 and first deployed in significant numbers for the SEaOS (Southern Elephant seals as Oceaonographic Samplers) project. This further development was supported by a grant from the National Oceanographic Partnership Program, funded through Stanford (Barbara Block) and UCSC (Dan Costa). The SEaOS project led to the larger MEOP project that initially involved researchers from 9 countries that has now grown up to include more than 40 researchers from 13 different nations. The core missions of the MEOP consortium are (1) the production of a quality-controlled database of oceanographic data obtained with instrumented marine animals, and (2) to maintain the present data portal from where information and data can be accessed easily. MEOP also acts as a natural bridge between the scientific teams that deploy the tags and the scientists who use the data.